Montalvo Arts Center | News | Rock the Garden July 20, Shakespeare Santa Cruz in September! Rock the Garden July 20, Shakespeare Santa Cruz in September! Join us for Rock the Garden! Asalto (detail), by Daniel Canogar. Visitors are invited to participate in his interactive piece, which will be projected onto the Villa. Get ready to Rock the Garden on Friday, July 20, from 7-10pm as we celebrate the official opening of Montalvo's annual Sculpture on the Grounds program with the theme of Montalvo: Making Place Public. The evening will be filled with art, dance, food and drink, and music! 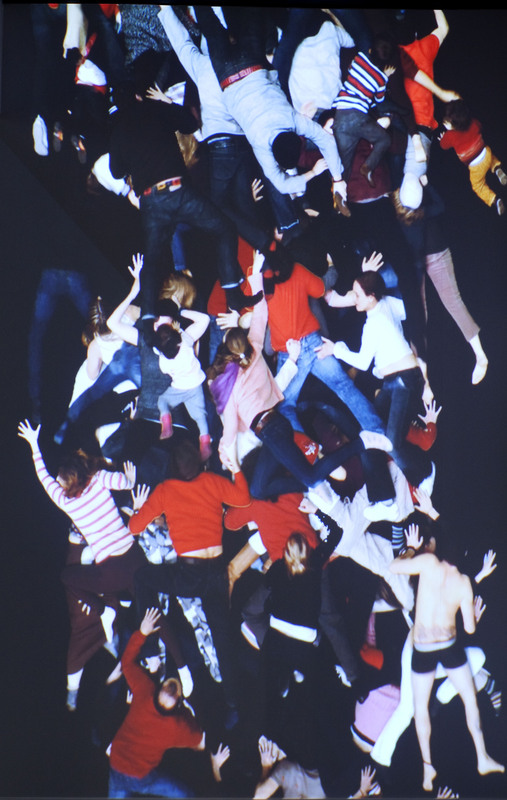 Get in the groove with eclectic San Franciso-based band Tin Hat, enjoy a dance performance by Jeannine Charles/ArtistEDGE, and then participate in a monumental live video art piece by media artist Daniel Canogar: an enormous projection on the historic Villa, entitled Asalto Montalvo. Several gourmet food trucks will be on hand, while beer, wine, and soda will be available for purchase. Admission to this fabulous evening is FREE! please carpool if you can! Robin Lasser and Adrienne Pao's Edible Dress Tent blends fashion, architecture, and performance art. 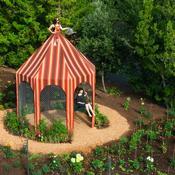 Standing over 15ft tall, it incorporates edible flowers, herbs, and fruit-bearing plants. Kianga Ford has created a site-specific audio experience with Mamoru Okuno entitled you are here...man. mountain. valley. 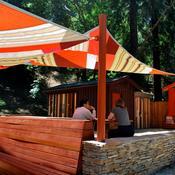 sky that activates the newly-renovated Belvedere, and Montalvo's hiking trails leading up to Lookout Point. To fully experience this project, download the audio tracks from our website to your phone or MP3 player prior to the event. Trachtenberg celebrate the completion of The Creekside Studio, a new outdoor environment designed for communal gathering, art making and engaging with nature. The space includes Counterpoint, an artwork by Trachtenberg that is integrated into the site. Steven Simon's text-based sculpture benches, entitled PLACE, are also on view on Montalvo's Great Lawn. Other temporary and permanent works are on view throughout the property. See the full list of current Sculpture on the Grounds here. In the Project Space Gallery, Montalvo Historical Fabrications & Souvenirs will be having a blow-out sale. Everything must go! If you're a Montalvo Member, arrive early (at 6pm) for first crack at the sale, plus a sneak peek at the sculpture and a chance to meet some of the artists. If you're coming to Rock the Garden, be sure to RSVP on our Facebook Event Page! First place prize will be two places at the nightly Lucus Artists Residency evening meal, in the company of visual, musical, and literary fellows and prepared by Culinary Fellow Niki Ford. For all photo contest terms & conditions, visit montalvoarts.org/terms. Sculpture on the Grounds 2012 was made possible with the generous support of: Arts Council Silicon Valley, CompoClay, Susan & Bob Finocchio, David Hisaya Asari, Hotel Los Gatos, Connie Hwang, Diego Mellado Martinez, David & Lucile Packard Foundation, National Endowment for the Arts, Riverview Systems Group, James Stone, and Anthony Teixeira. 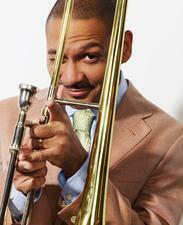 Delfeayo Marsalis performs October 13. If you aren't a Member at Montalvo, you're missing out on the best seats at our fall, winter, and spring concerts in the Carriage House Theatre, including our popular Piano Masters! The exciting lineup includes Richard Thompson, Marc Cohn, Spyro Gyra, Suzanne Vega, comedy by The Second City and Reduced Shakespeare, and a whole lot more! We've also expanded our Martini Madness pre-show cocktail hours to include Ka 'Aha Mai Tai parties before our Hawaiian concerts. There's still time to join and get your tickets today! Call our Membership Department at 408-961-5849, or join online. Tickets go on sale to the general public July 16. Join us from September 8-16 as we present six performances of William Shakespeare's beloved comedy, Twelfth Night, in the beautiful outdoor Lilian Fontaine Garden Theatre. This wonderful production will be staged by one of California's most prestigious Shakespeare companies, Shakespeare Santa Cruz! One of the Bard's most enchanting of comedies, Twelfth Night is a classic tale of mistaken identity and a hilarious love triangle run amok. 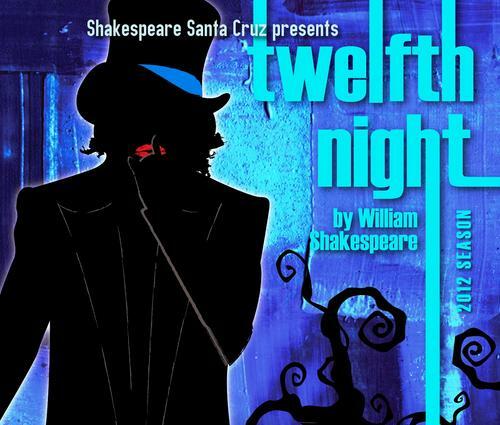 Shakespeare Santa Cruz has been interpreting the bard's classic tales through a modern lens since its formation in 1981, and their outdoor stage performances are not to be missed! Montalvo will host six performances, including a preview matinee on Saturday, September 8, at 2pm, followed by Opening Night on September 8 at 7:30pm. Two more Sunday Matinees (September 9 & September 16, both at 2pm), and two evening shows (Friday, September 14, and Saturday, September 15, both at 7:30pm) round out the schedule. Tickets can be purchased online or through the Montalvo Box Office at 408-961-5858 10am-4pm Monday-Friday.